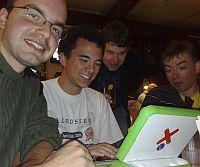 Whew, what a geek-fest at last night's OLPC News Meetup in Washington DC! With three OLPC XO's, a Asus Eee PC, a Sony eBook reader, an iPhone, and a whole smattering of laptops and even a Freeplay Weza, it was computing central at Washington DC's RFD. First we tried the Sugar interface and the different applications available. We spent some time playing with the python interactive interpreter in Pippy at which point Mohammad found how to get to a linux prompt. One would press CTRL-ALT-F1 except that there is no F1 but one should press the button where F1 sits. CTRL-ALT-F3 takes you back to X (again there is no F3). On the prompt the root login didn't require a password. The OLPC was running a ssh daemon and we tried to connect it to a Dell laptop running Ubuntu but for some reason we couldn't. Both, the OLPC and the laptop were seeing the same access point (identified as the Mesh network) but we wouldn't be able to connect to it or even ping it. Thanks for organizing this. Even though it was a bit disappointing that we couldn't connect the OLPCs in the mesh it was a fun evening. I, on behalf of Telstra (Australia) just called the international support line to G1G1 of 100+. There are 55,000 employees so we think 100 will be a easy target (5 on our floor of 40 want one each) I personally think we could G1G1 of 10,000. They flatly refused and said 'no' to every option proposed including a bulk delivery that we pay for all shipping. Now that is sad as we now have to find a U.S office to send to which is a major un-needed hassle. For me there is no doubt that the XO is the best educational and technical machine out there (vs Intel Classmate and Asus EEE) but it's not sufficient not even necessary to have the best product to gain wide adoption (ask Microsoft). Now that the XO has entered mass production I believe the OLPC project should concentrate *now* on starting the ecosystem, the layers of the onion, to hopefully reach a sustainable critical mass (of software developers, content creators, advocates, to sell more, to lower the price, etc). I believe it just won't happen with the actual distribution scheme. In regard the XO is a heaven but where are the well deserved vibrant layers?? It's been a while I'm following these official OLPC lists, at least, but sadly, they doesn't flood my mailbox. In the meantime Asus recently released the EEE subnotebook. Officially it is not for education (they say now) and you can buy it everywhere *now* (or soon) with an ASUS 2 years warranty. I can't buy an XO and consequently can't contribute to the XO project, I will then buy an EEE and probably contribute to the EEE layers. I find that ironic considering that I'm fully in sync with Nicloas Negroponte, Papert and Kay main ideas and approach. François, you are not alone in your frustration with OLPC's foolishness. Circling back to last night's OLPC News Meetup, there was serious OLPC love in the room. We all fought for the clock-stopping hot technology. 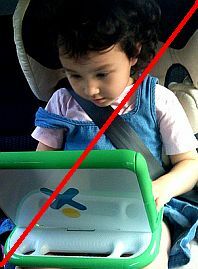 Yet we all feared that OLPC's arrogance will create great waste and disillusionment with technology across the developing and developed world. I saw a billboard advertisement for the OLPC buy 1 give 1 campaign at the Pentagon City Fashion Center (2nd floor). It has the picture of the African girl with the computer balanced on her head. I wonder what people thought of it. It is next to advertisements for Rolex and Gucci. I was very let down with the networking of the XOs; I didn't see anyone successfully connecting any of the three units we had there to either the hotspot or even each other. From one of the XOs I was able to see the other in the Neighborhood view after the meshes got linked, but unable to chat/share apps/etc. My ubuntu laptop was able to get online at RFD's hotspot effortlessly (which is pretty amazing given its tendencies towards curmudgeonliness with random wifi). I sympathize with all who feel frustrated at the initial launch plans for the XO laptop... even those in North America are uncertain as to shipping dates. But global product launches are tricky to pull off even for multinational companies with years of experience. So lets try to be patient and ride out the inevitable mis-steps. The product and the concept are worth it. Can't call method "blog_id" without a package or object reference at /kunden/homepages/32/d90954479/htdocs/bbwpublic/mt/plugins/TinyTuring.pl line 102. I tried again and the third time worked. Thanks to everyone who brought their XOs and Asus EEE last night. Hopefully, we can have an XO user meeting or something have we've had them for a few months. I have a few long flights coming up next month and I'm hoping my XO miraculously shows up by then. BTW, what model of the Igo charger and what tip was used for the XO when it was hooked up to the foot pump charger? The XOs that were there last night were very likely all using different recent firmware. That's the case with the two that I brought because I've been skipping some of the builds and releases now that they've gotten more frequent, and not updating my two devices on the same day for fear I could end up with two bricked laptops. What I'll do is get both my laptops in sync, take them back to RFD to test out the connection and report back. Con, I searched high and low for the proper plug as a spare part and finally fell back on the iGo system. What I had last night was a recently discontinued "iGo Auto/Air Power 40" adapter which is made primarily for portable DVD players and other small gadgets. The included tip D00, color-coded red, fits the XO perfectly. It just so happens that many Radio Shack stores have these $50 adapters on "Manager's Special" close-out for $19.95. I bought several. I know the RS in Chinatown had eight of them on Wednesday. If you can't find this iGo, I also have the "iGo everywhere 130" which I can tell you comes with tips that will power both the XO and the ASUS Eee PC (as well as a variety of other laptops). The 130 is pricey at $95, but it's extremely versatile in the number gadgets it can power and well constructed. I'm working on a blog post about the power plug options. "The OLPC was running a ssh daemon and we tried to connect it to a Dell laptop running Ubuntu but for some reason we couldn't. Both, the OLPC and the laptop were seeing the same access point (identified as the Mesh network) but we wouldn't be able to connect to it or even ping it." From this and the above comment #3, it sounds like networking was pretty miserable! (Too bad, because I have ordered one, and I want the networking to rock ;)). However, I'm a little confused about what happened exactly, and which laptops could see what. Why would the access point be identified as "the Mesh network"? (Was the SSID set to this?) Does an access point need to be running special Mesh-friendly software to be an effective wireless access point for the XO? Can the XO forward packets to/from *non*-XO laptops with the same hardware that lets it (theoretically) create a network cloud for collaboration between XO users? That is, can I (with an XD, and in range of a wireless access point) forward packets to / from my friend Jane, with a non-XO laptop, who is herself out of range of the wireless access point? Yet another way to ask what I consider a slightly confusing question: I know an iBook with OS X can be set up to share a wired (ethernet) network connection over its wireless card, effectively turning it into a wireless access point. Can an XO be used the same way, but sharing a *wireless* access point? That's a good question. You're essentially asking if the XO can be a WiFI-only repeater. From what I have seen with my XOs, I think not at the moment. In the neighborhood view, I can only seem to choose WiFi or laptop-to-laptop mesh, but not both. Somehow my answer to your questions lost the middle part of the text. Answering your first question, no, the SSID was not set to "the Mesh network". It was set to the name of the restaurant. No special software is needed on the access point in order to allow an XO to connect. Cultural roots foundation brings together the 11 kingdoms and chiefdoms in development to speak with one voice of Uganda. These kingdoms form Uganda. We would like to promote this project for our childeren in Uganda througout the kingdoms and chiefdoms. Can you include Us as a perticipating country. We would like to buy about 4 samples for testing. Can you please let me know how to bo about it. Distribution and production of the XO laptop to meet the audacious goals of "One Laptop Per Child" are by no means trivial. There is no single organization who could do this today easily. It seems unfair to put Asus and OLPC into the same sentence when thinking about the multitude and magnitude of pure business issues related to this. If you think about it, the challenge is tremendous! Besides the financial commitments and the production cost issues, there are export laws, physical shipping logistical issues, distribution issues, etc. This is the classic intersection of a great idea needing the discipline of business analysis. Its nowhere near easy, and I think OLPC need help here. Does anyone have a REALISTIC minimum battery life estimate, when the OLPC is under full load? Thanks Mike Lee for the info on the discontinued iGo power adaptor that fits the XO. I bought one on eBay today for $4.99 ("Buy Now" price) plus shipping. The seller has 7 more -- item # 200183316027. Holymoly, that's a great deal on the iGo auto/air power adapter! Having the car plug will give you the capability to plug into solar panels like the Sunlinq series. Just be careful to get a model that puts out 1000MA (1A) or more like the one linked above. Elliot, the OLPC team hasn't activated the "aggressive" power management on the software of this initial batch of laptops. I'm only getting about 3 1/2 hours under full load. But when the power management is activated (perhaps in January), hopefully we'll get closer to 5 or 6 hours.